Alright, the common thing all these themes have is that they all help you create your own education-related websites easily. But what makes them different from each other. Let’s check it out in detail. 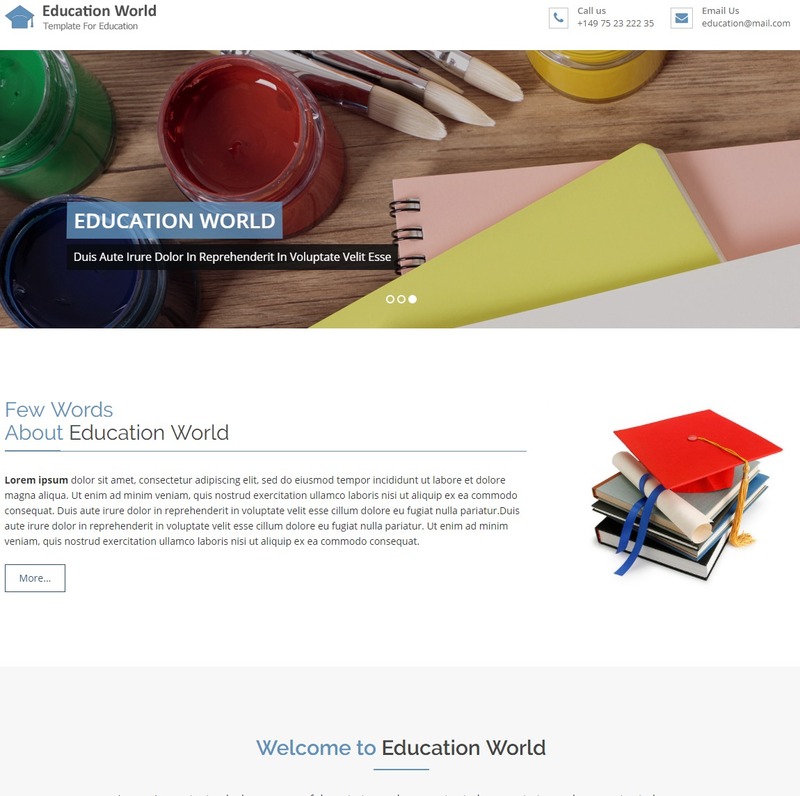 Education WP is one of the complete WordPress education themes. It provides you with everything that needs to be on an education-related website. This education theme is built on latest Bootstrap 3 and font-awesome 2 which makes the front-end of the theme faster and easier. Besides that, it offers you more than 9 demo layouts out of which you can choose any one of it and customize it as per your requirement. This theme also makes it very easy to manage the commission rate for each course. Furthermore, this theme incorporates LearnPress WordPress LMS plugin. Also, it is highly optimized with Microdata. Best of all this Education WP is frequently updated. Incorporates LearnPress WordPress LMS plugin. 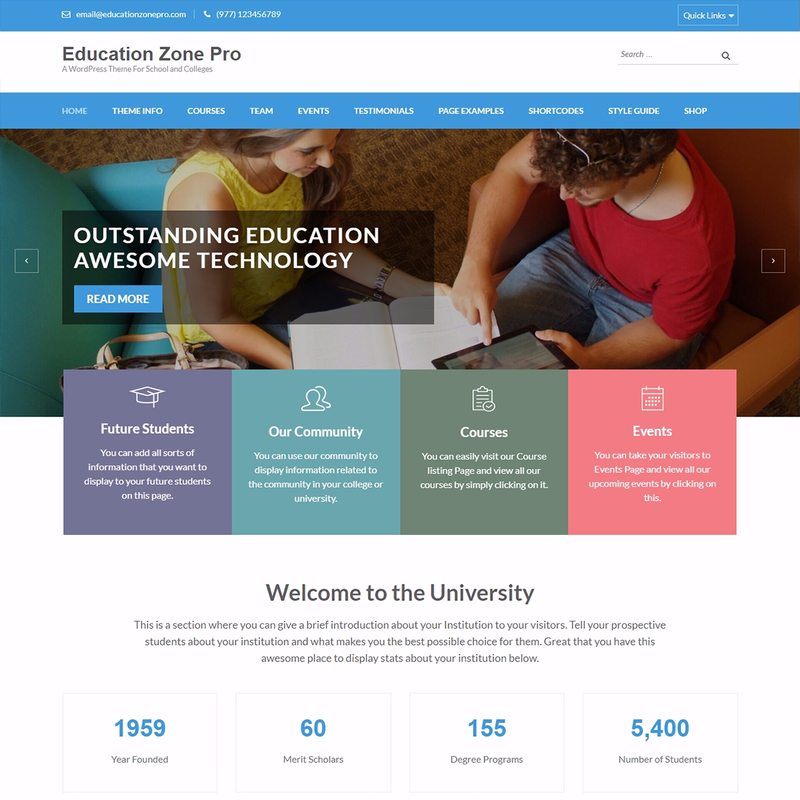 Education Zone is a clean and elegant WordPress theme that helps you make your educational website stand out. This theme fits in all kind of education-related websites regardless of the size of your institution. Moreover, Education Zone is well optimized for all kind of devices. Furthermore, this theme offers you a bundle of customization and personalization options. it also includes a wide range of outstanding features that are very useful for a number of educational uses. Such features include 5 custom pages, WooCommerce, WPML and Polylang compatible, custom menu and many more. 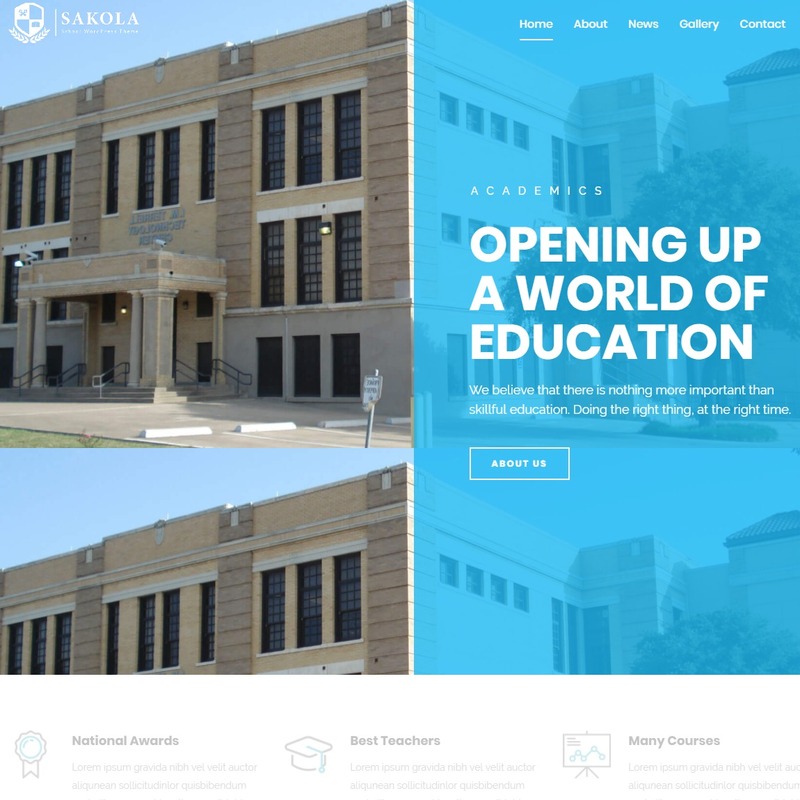 Sakola is one of the best WordPress school themes. This can be one of the finest choices for the schools that want its institute to have a strong online presence. Skola is a beautifully designed and incorporates many powerful features. Moreover, this responsive theme provides you unlimited design options along with powerful admin panel. Drag and drop page builder, extensive theme options, and easy customization are some other notable features of this theme. Furthermore, you can easily import any of its demos on a single click with one click demo importer. Moreover, it provides you with the full control over the typography setting for each and every element. 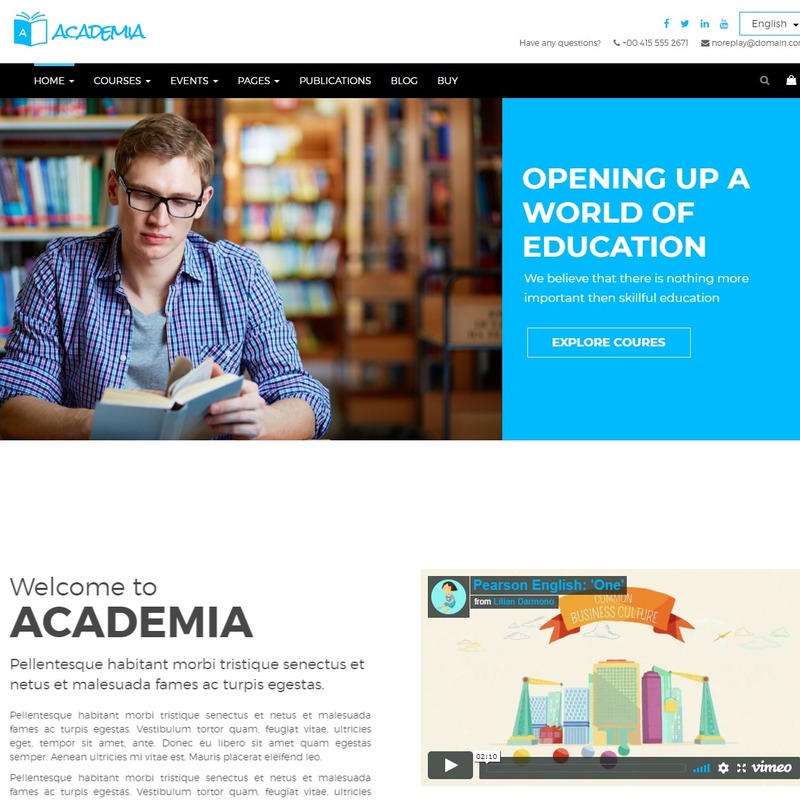 Academia is a modern, fully responsive WordPress theme that is specifically designed for educational purpose. It is one of those WordPress education themes that focus on quality design and practical functionality. Additionally, Academia is built on best SEO practices and is frequently updated. Moreover, it is extremely easy to use as well as to customize. It is compatible with popular plugins like WooCommerce, Visual composer page builder, and revolution slider. It wouldn’t be wrong if I say there are only a few countable education WordPress templates or themes that could match its alluring design, outstanding features, and intuitive structure. 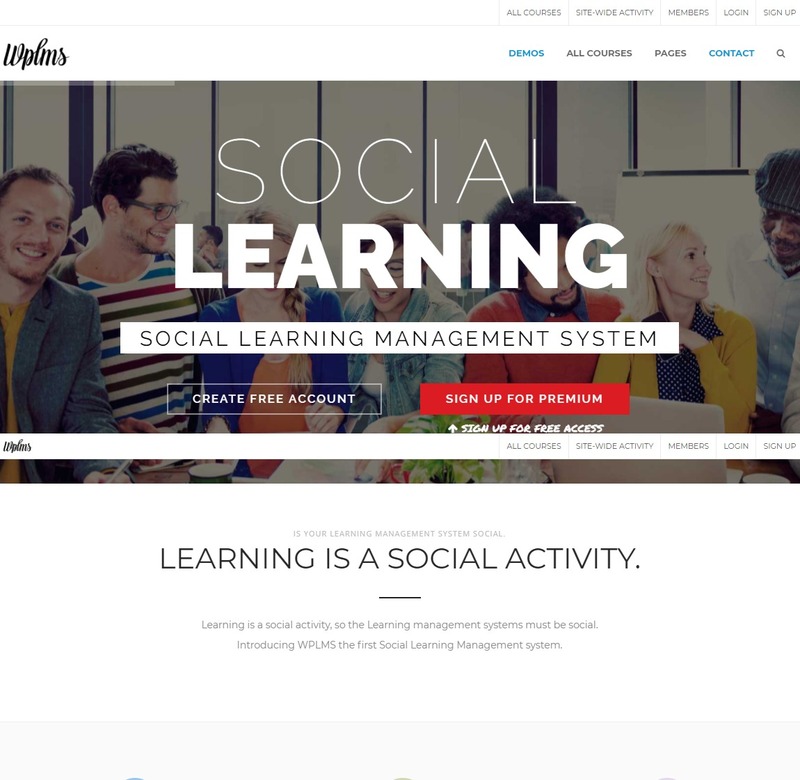 WPLMS is a complete eLearning suite and one of the best education WordPress themes around. 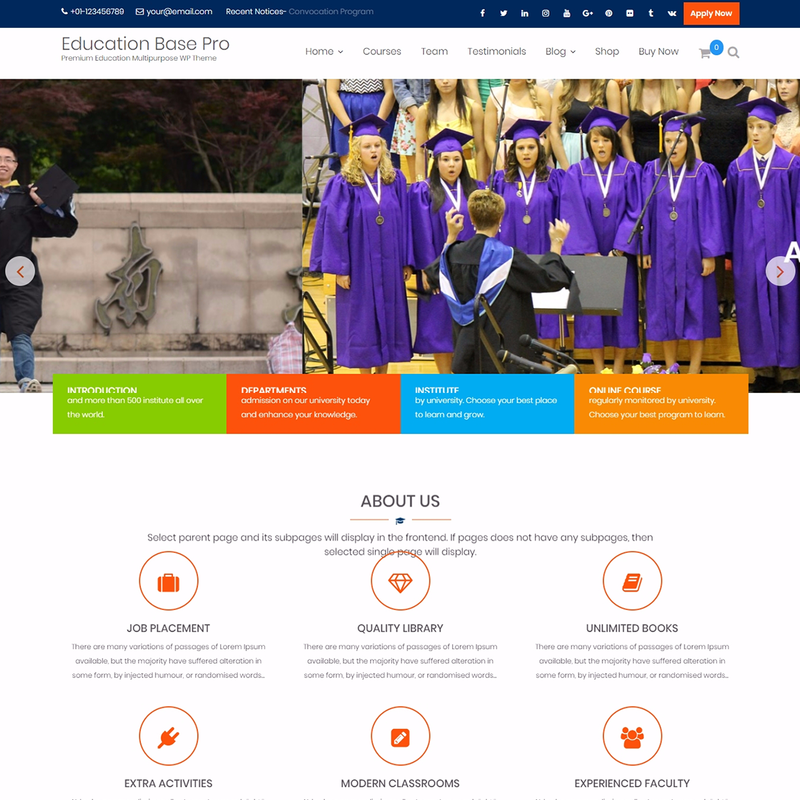 This theme is well suited for the needs of the educational organizations’ websites. With WPLMS you can create your own online or eLearning academy like Lynda.com. WPLMS comes with over 700 incredible design options and 8 amazing demo sites. It gives you complete control over the personalization with multiple and easy customization options. Furthermore, one-click data import helps you set up your theme with demo data in no time. Moreover, you can also sell your courses via WooCommerce, memberships or points. WPMLS also allows easy front-end course creation. Thus, you can create/ edit courses, units, set prices, course groups, forums and more. 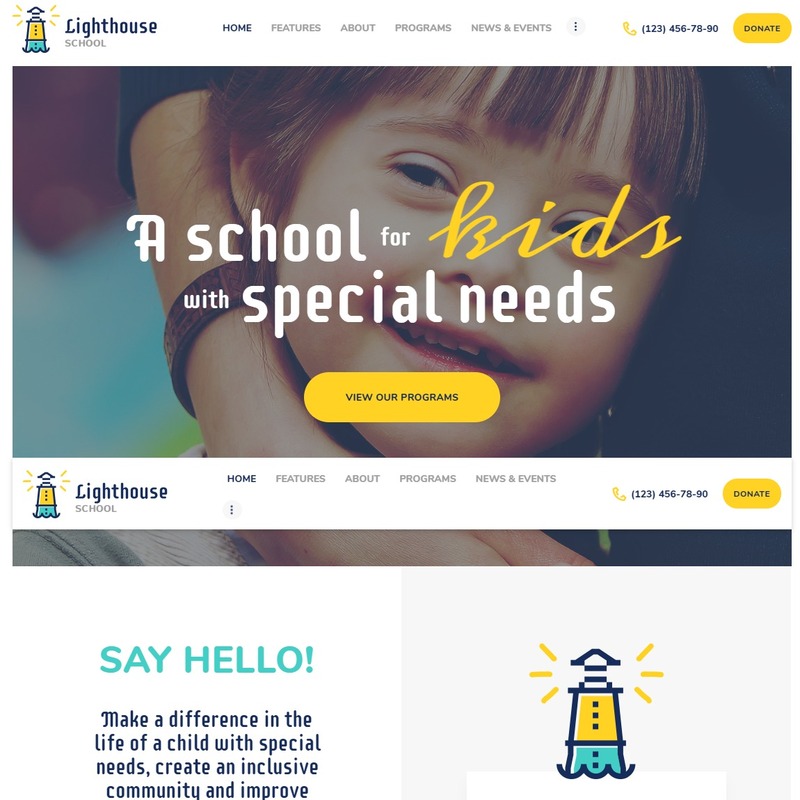 Lighthouse is a WordPress education theme that helps you create a website of a school or kindergarten for children with special needs. This theme upholds the compelling statement “Education for All”. Thus, it is one of my personal favorites and is on the list. Lighthouse has a very clean design backed by solid functionality. The best thing about this theme is that you need no coding knowledge to create your own website. In addition, this theme comes with a powerful admin interface and parallax background effects. There are a number of plugins bundled with Lighthouse. Visual composer, Mailchimp, Booked appointments are some popular ones. 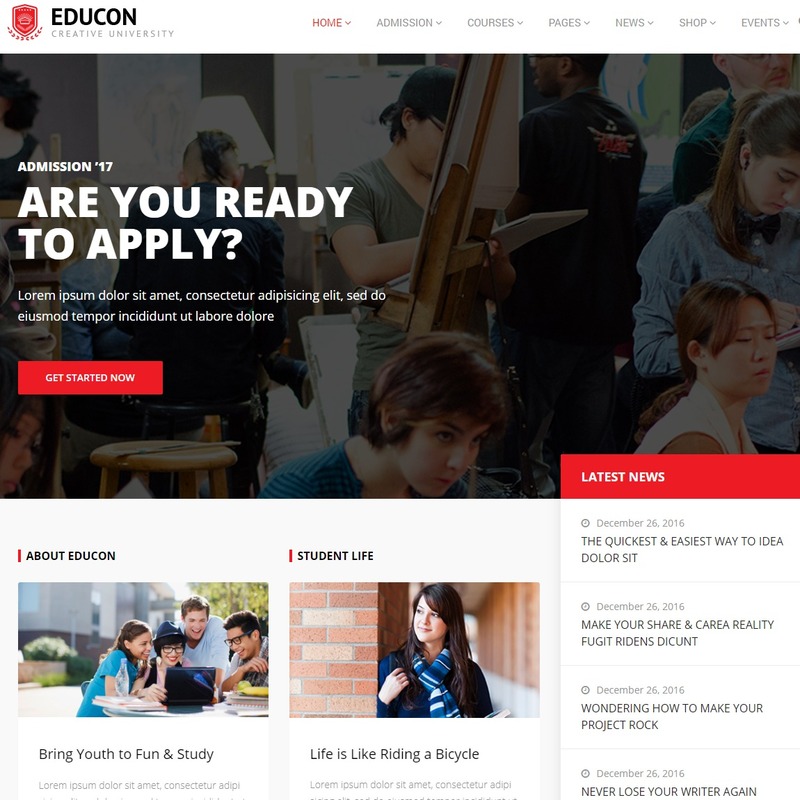 Educon is one of the clean, responsive educational website templates. It is ideal for all kinds of educational organizations. Be it educational training centers, college, university, schools, corporate training, coaching centers, course tutors. In fact it one of the globally popular WordPress education themes that come with unlimited personalization possibilities. By using the advanced customizer you can create a professional looking academic site without a single line of code. Besides, it also allows you to create noticeboard, event albums, profile listing and course listing system on your website. 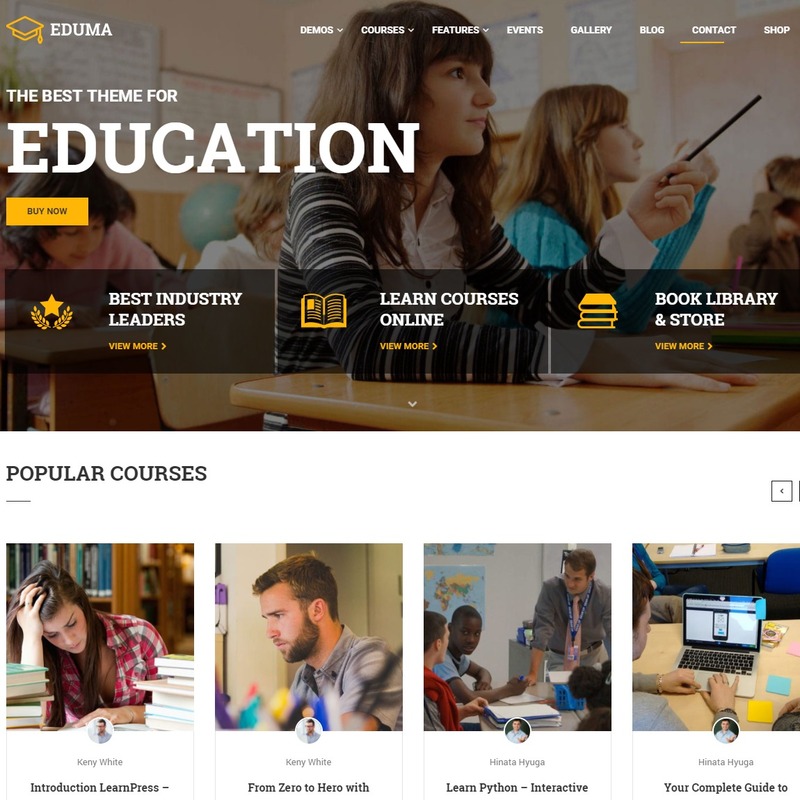 If you are looking for a perfect WordPress education theme then Edutech is definitely the one that you should take into consideration. Edutech is peculiarly designed keeping in mind the learning centers and its website requirements.Thus, it provides is a fully functional learning platform. This theme is power-packed with various incredible features to create not just alluring websites but user-friendly too. Such features include unique homepage variations, cross-browser optimization, smooth transition effects, popular plugins compatibility and many more. Another on our list is Masterstudy. Master study is an elegant education theme that is enriched with many powerful premium plugins.Thus, it saves you both time and money. Blog post layout varieties, three kinds of photo and video galleries, two header options, four skin presets are some of the notable features that this theme comes with. Also, this theme comes with so many other features that make the customization tasks super easy. All in all, Masterstudy best suits the educational organizations, who sell courses and organize classes locally. 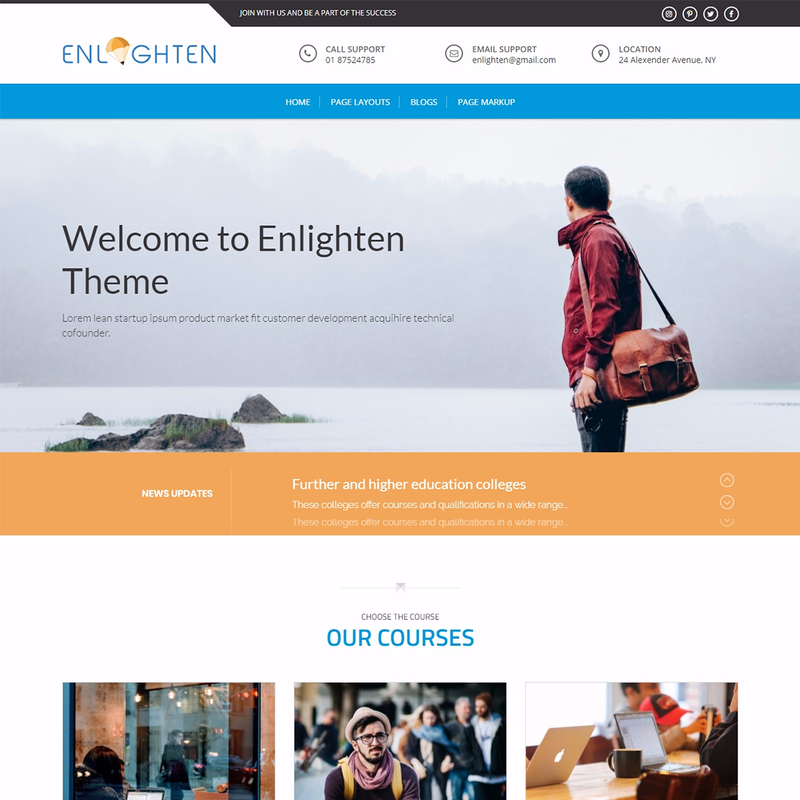 Bright is another Education WordPress theme on our list that makes it hassle-free to build, customize and manage your website. Not to mention, it is one of the beautifully crafted WordPress education templates with full attention to its functionality. Basically, Bright comes with two homepage variations. First one is the general one which is specifically crafted for educational institutions like schools, colleges, and universities And the second one is LMS. LMS is generally for the distance learning or online training. The second variation is based on a very popular as well as powerful LMS plugin Called LearnPress. 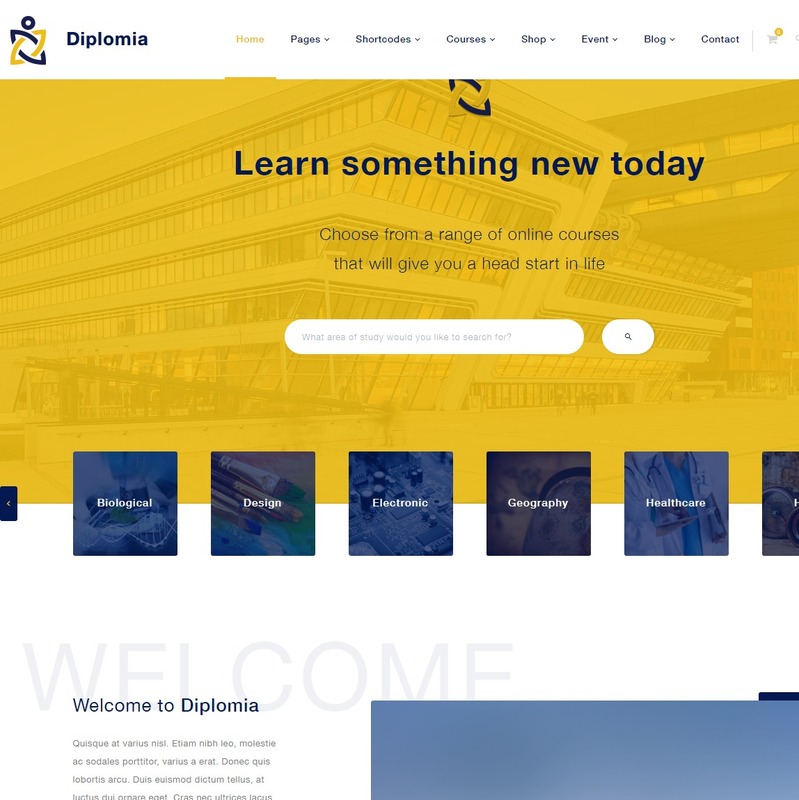 Diplomia is one of the fully responsive WordPress education themes on our list. In fact, it is highly appreciated for providing best user experiences in all sort of devices. This beautiful theme is built on Twitter Bootstrap and includes popular plugins like Visual Composer and Revolution Slider. Moreover, this theme uses LearnPress. Thus, you can create courses quickly and easily. Furthermore, it provides unlimited color options and homepage designs. 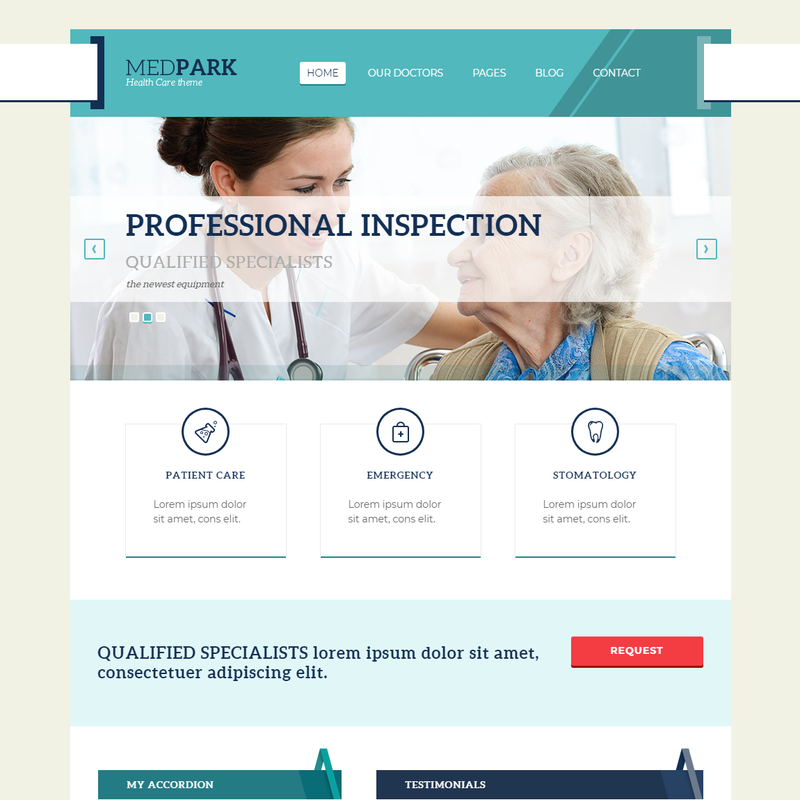 Medpark is an elegant, feature-rich, multipurpose WordPress theme. Henceforth, it can be used for creating a website for a hospital, medical center, school, university or any other education-related organization. Moreover, it is powered by Tesla framework and it consists of all the features required to create and run a medical/ educational website. Medpark also offers you with a pool of customization options to help you get your site up and running in no time. It comes packed with a great wealth of features specially created for medical sites. It includes multiple custom post types and widgets, featured slider, and a rich set of shortcodes. 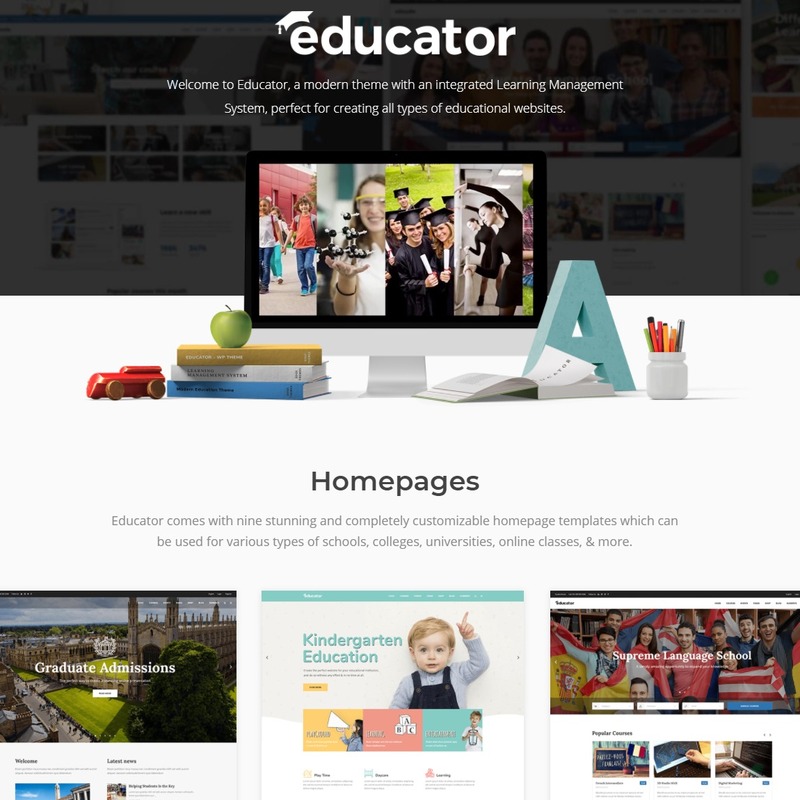 Educator is one of the clean, visually impressive and readily responsive WordPress education themes. Like all other themes on this list, it also comes with an outstanding feature set. Some of which are compatible with major popular plugins like bbPress and WooCommerce, 2 header types, and parallax images in sections. Beyond that, it offers you a powerful admin interface, highly customizable typography setting, and 9 fully adaptable homepages. overall, With this theme, you can easily customize the look and functionality of your theme within some couple of minutes without a single line of code. 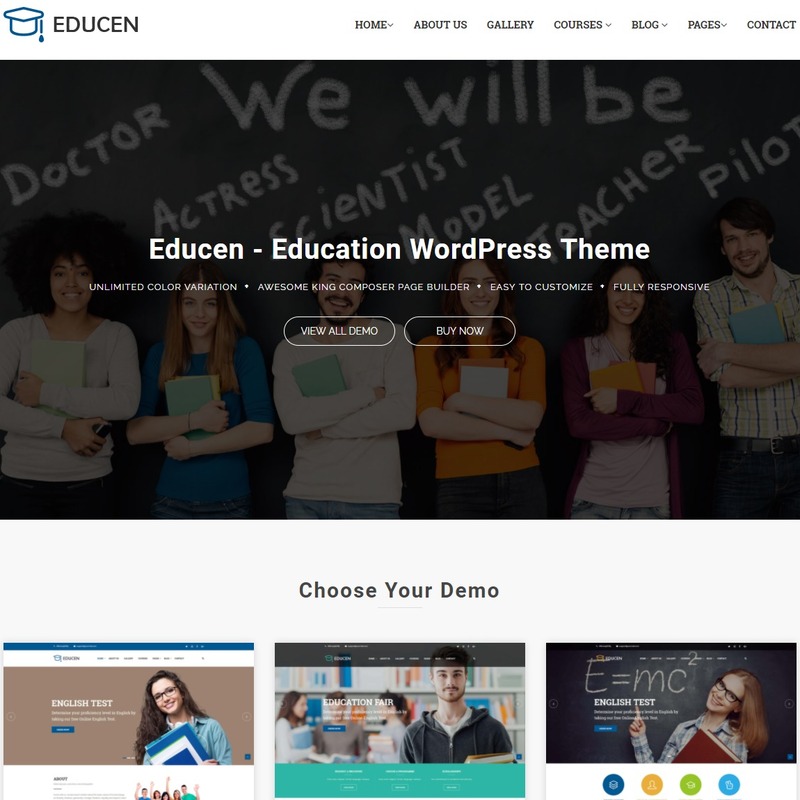 Educen is yet another beautiful WordPress theme which is build based on King composer. It is suitable for all kinds of educational websites.It is also highly customizable. In addition, it offers near-unlimited color options for design and content elements. Moreover, it comes with more than 40 KingComposer add-ons and 4 different header styles. Furthermore, Educen incorporated a wide range of powerful plugins like Yoast SEO, Mailchimp, Askimet and more. This theme is also developed using best SEO practices. Thus, it ensures the best results for search engine ranking positions. 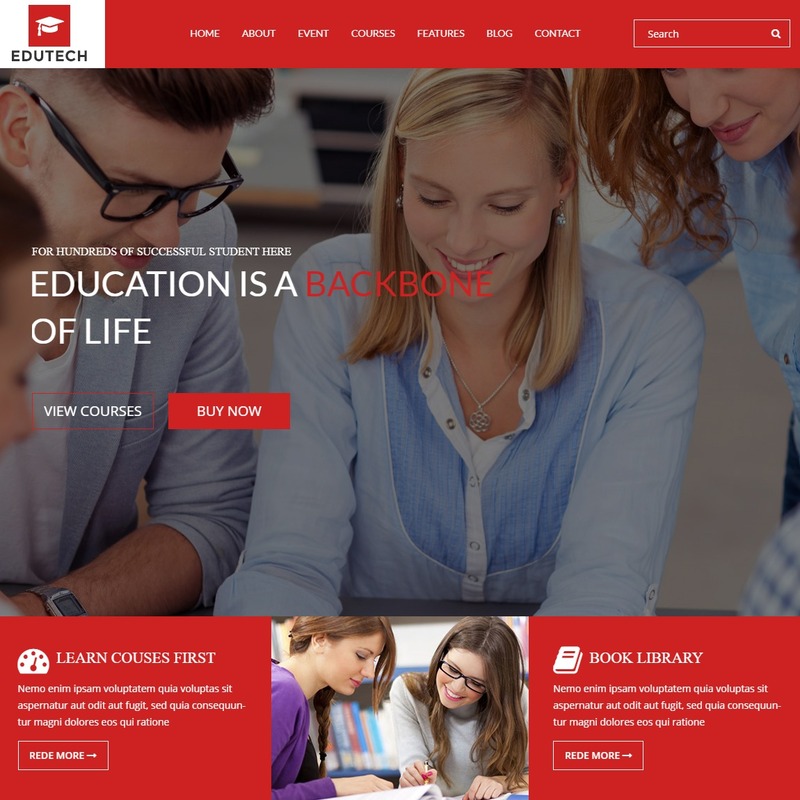 Education World is a premium education based theme coded with Bootstrap framework. The creative design of the template makes it stand out from the rest of the WordPress education theme. With the template you can create course pages, grid, list as well as complete user’s sign in and sign up option which makes it great for school and university websites. The design carefully created is responsive and mobile friendly which is another great feature. Furthermore, the template also features drag-and-drop feature and visual composer which makes it easy for you to build your website into anything you want. Over 600 different Google fonts to choose from. Easy Set up with one click installer. Academic has been created especially for universities and course-related websites. It is one of those WordPress education themes that is incredibly designed with top-notch functionalities so as to provide the world-class user experience. In addition, this theme comes loaded with 35 Visual editor elements and more than 30 theme options. Besides, it also includes 2 homepage versions and 4 post formats. Also, it consists of 2 header and footer heading styles and 15 pre-made pages that are super easy to customize. 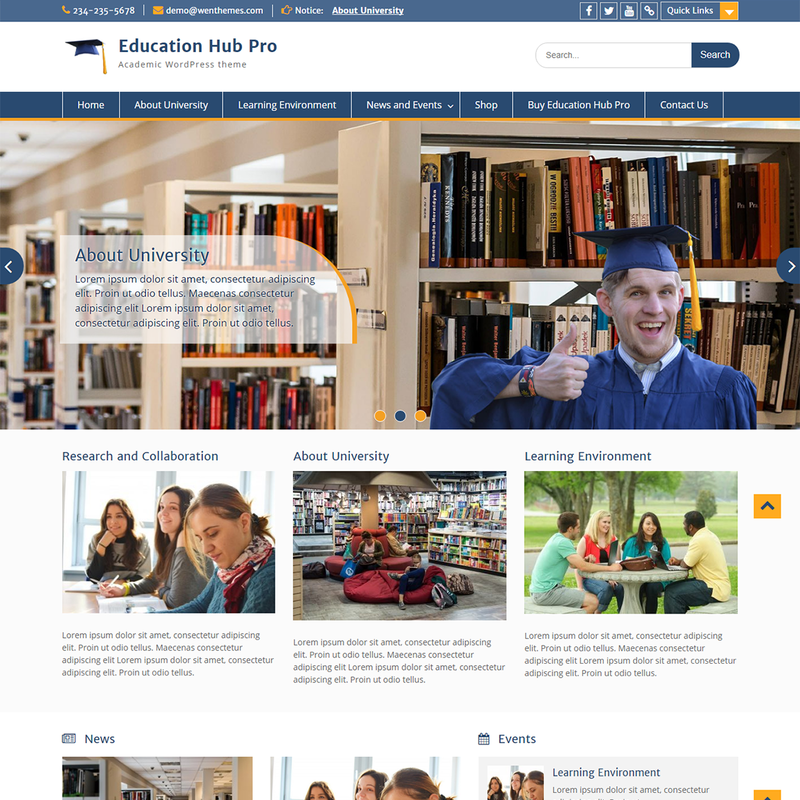 A clean and elegant WordPress education theme, Education hub is best suited for college, school, and other educational websites. Being a flexible and customizable theme, it can also be customized for other types of website. The theme also comes with multiple layout options that you can choose from. If you are looking to build a professional looking website for free, this WordPress template is the one for you! Furthermore, the theme features custom backgrounds and colors as well as menu and header. Custom Background and Color Option. Education Base is another awesome Education WordPress template that is brought to you by the Acme Themes. Attractive and modern design, the theme also features stunning flexibility. This means that you can use this template on any kind of website you wish although it is perfect for education based websites. The template is easy to setup and to customize using the drag and drop feature that it offers. Other awesome features of the theme include advanced color options with slider selection, integrated social icons as well as the custom copyright options. Stunning responsive and mobile-friendly design. Advanced color and design options. Helpful support system at all times. As the name says it, this education WordPress theme is here to enlighten the website that you build with its features. 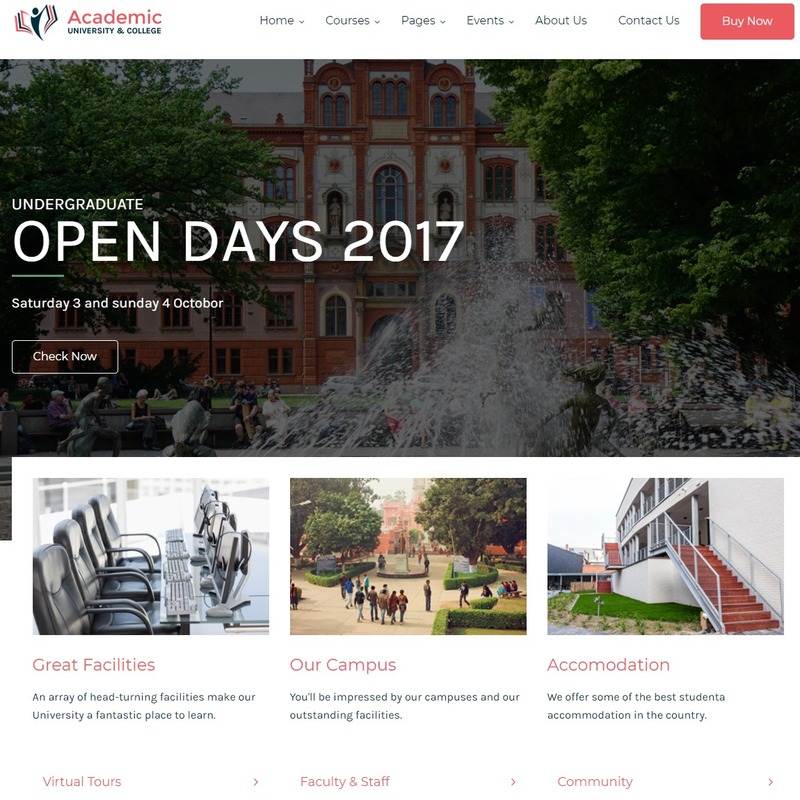 Responsive and mobile-friendly, the template is ideal for the school, university, and other educational websites. In addition, the theme is flexible and customizable which makes it a great theme that you can build however you wish to. The theme also features multiple widget options and menu area for you to build on. Moreover, it is a really easy process of setting it up as the theme comes with a one-click installer. Multiple widget areas and menu options. 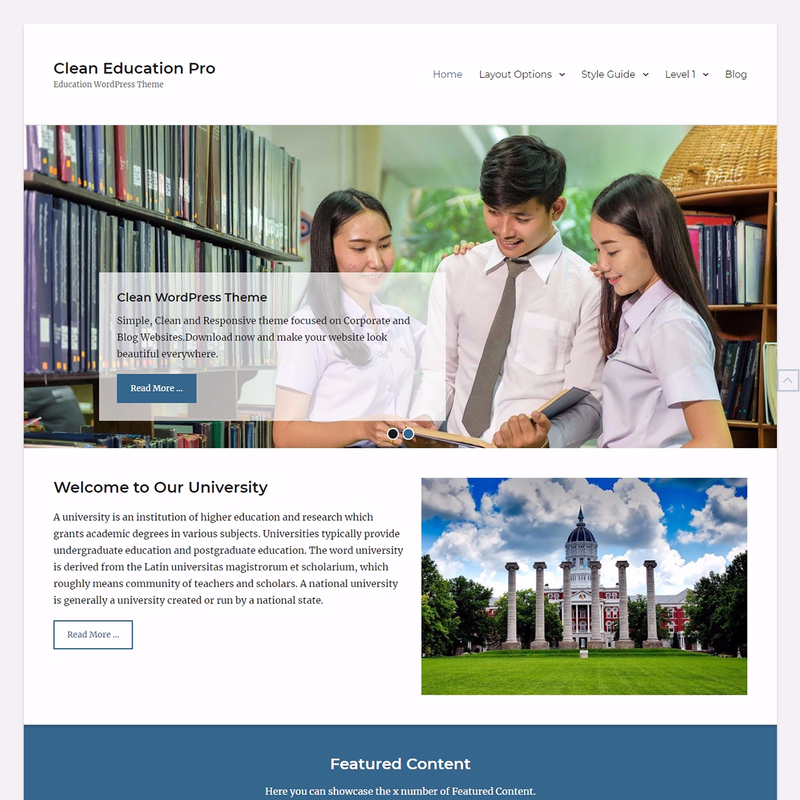 If you are up for yet another great free education WordPress theme then take a look at our last listing, Clean Education. Responsive and clean design, this template is perfect if you want to portray your education website in a simplistic and elegant way. Furthermore, the theme being flexible is really easy to customize with its powerful customization options. Besides, the theme features separate sections for courses, professors, recent news as well as events and testimonials. This makes it easier for your users to access contents on your page giving them a lasting impression. Easily customizable options with powerful tools. Separate section for each content. To sum up, the above-listed education WordPress themes are best for all kinds of educational institutions- online or offline! And if you are looking forward to creating impressive WordPress sites for you educational institutes, then trust me, these themes can be your greatest allies. Hopefully, these elegant yet feature-rich WordPress education themes will help you create professional looking educational websites with ease.